Below are links to access / download various assets for Dr. Fiona McCulloch’s “8 Steps To Reverse Your PCOS”. If you need something that is not listed below, please contact us and we will get back to you as soon as we can. Having successfully reversed her own PCOS naturally, Dr. McCulloch now practices what she preaches. Her new book, 8 Steps to Reverse Your PCOS, was released in September 2016. In her new book, and during an interview, she will empower your audience to understand their bodies and restore their own balance. Like her customized clinic approach, she can take into account a patient’s unique symptoms and life stage to offer the most comprehensive treatment. Her thrill of scientific discovery, sound methodology, and passion for teaching has also helped inform the clinical practices of her peers in both naturopathic and conventional medicine. What are the main signs are of PCOS and how a woman would know if she has it? What is the best diet is for a woman with PCOS? Fiona has published many articles and is a regular contributor to NDNR, one of the leading journals for naturopathic doctors as well as other publications for health professionals. Her popular research-based blog has 30,000 readers per month and her first book “8 Steps To Reverse Your PCOS” will be published on September 20th, 2016 for PCOS Awareness Month. Fiona also frequently lectures to professionals including naturopathic doctors and integrative medicine clinicians and also to students at the Canadian College of Naturopathic Medicine. Fiona is a proponent of evidence-based natural medicine and peer-reviews for Natural Standard, an database on evidence-based natural medicine. Fiona is a graduate of the Canadian College of Naturopathic Medicine (2001) and the University of Guelph (Biological Science/Molecular Biology and Genetics). Please see our Terms and Conditions page for authorized use of the resources below. Click photo for full sized image. png format. Right click image and click “Save Image As” in browser. When it comes to managing PCOS symptoms, knowledge is power. For women with PCOS, Dr. Fiona McCulloch's Groundbreaking new book is a wealth of this immediately applicable information that can make a difference in learning to manage their symptoms. Dr. McCulloch has interpreted all of the latest PCOS research and applied her own knowledge and expertise to create an easy-to-read, comprehensive resource. This brilliant Book is the must-have guidebook for any woman who wants to manage her PCOS with a holistic lifestyle approach. Dr. Fiona can certainly be counted among the great PCOS medical experts, such as Dr. Walter Futterweit and Dr. Samuel Thatcher, who have blazed a trail of empowerment for the PCOS patient. Dr. Fiona's eagerly awaited book on PCOS is everything I hoped it would be: comprehensive and insightful. 8 Steps to Reverse Your PCOS is a detailed, engaging, and practical approach to the very complex issue of PCOS that it is easy to understand. Dr. Fiona puts each piece of the PCOS puzzle in place to provide a truly complete answer in restoring proper hormonal balance. I highly recommend this book! PCOS is a topic that is past due for global attention and clarity, and Dr. McCulloch’s book delivers on these needs. 8 Steps to Reverse Your PCOS helps readers understand if PCOS may be the hidden cause behind their weight gain, hair loss, or missed cycles. It will also help them understand why they are afflicted and give them a path back to health. The recommendations given are safe, well-balanced, and evidence-based, and they come from Dr. McCulloch’s clinical experience and extensive research. The steps outlined also serve as an excellent guide for those with metabolic syndrome or prediabetes. Dr. McCulloch has done an impeccable job at capturing the whole picture of PCOS, including the emotional effects that are so commonly experienced throughout the journey. This book clearly and thoroughly outlines a step-by-step process that can be easily followed. 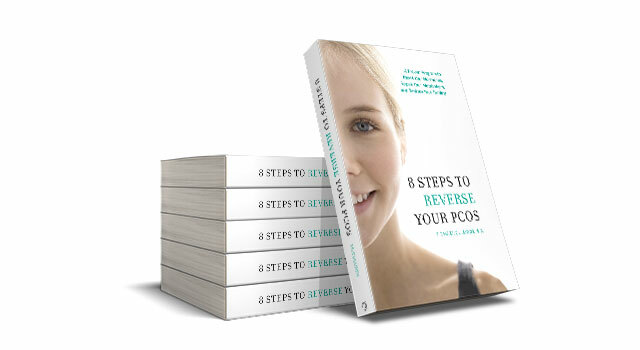 8 Steps to Reverse Your PCOS is a must-have resource for women with PCOS, clinicians working with women’s hormones or the emotional impact of having PCOS, and mothers of teenage daughters who may be experiencing symptoms related to PCOS. Knowledge is empowering, and Dr. McCulloch provides the knowledge and guides us through the actions necessary to grab hold of our life and turn it around!